The Juke Joint is the highlight of the Annual Blues festival held in South Australia each year under various names. This year it was the Backwater Blues and Roots festival which ran for over a week at various venues around Adelaide and some country/regional areas also. I had previously photographed the 2008 and 2009 event which was held in the old Queens Theatre. In 2010 the event moved to light square and I didn’t attend that year. I was looking forward to attending this year and was there shooting for “faster louder”. 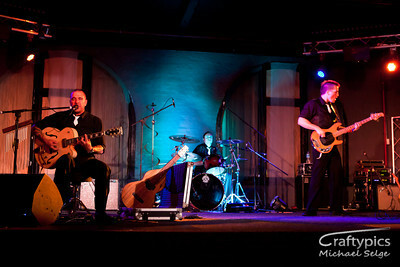 It was an early start to the evening which started off with Adelaide band the Streamliners. These guys have been around for a while and put in a pretty solid performance. Next up was Old gray Mule which was pretty cut down blues with just guitar and drums. Third act was Chris Wilson who is quite a renowned Harp player from Victoria.Joining Chris on stage were local guys Rob Eyers on Drums and Sweet baby James on Guitar. Being a fellow Harp player I really enjoyed listening to Chris blast out some Boogie Blues. The Highlight for me though was The Mason Rack band. So much energy from all the band members and they swapped instruments a few times as well – sort of a Round Robin. Gravelly Vocals, Slide Guitar, Manic bass and a Solid beat made for a great show. Even the Beer kegs got a percussive work out at the end of the performance. Highly recommended to see these guys if they are playing locally to you.